ImTOO iPad Mate for Mac is really an assistant for Apple iPad and Mac users. With it, you can backup or copy movies, apps and music between iPad and Mac without iTunes. And also it can sync iPad files to iTunes (photos and videos shot by the device are also supported). As a DVD to iPad converter for Mac and iPad video converter for Mac, the iPad manager can convert CD/DVD discs and convert videos/audios/ISO images/IFO folder to iPad compatible formats. Practical features offered allow you to create your own playlists, edit soundtrack information, transfer files between several iOS devices simultaneously, preview DVD movies and videos, capture movie images and add artworks. Fully supports iTunes 12 and all iPad, iPhone and iPod including iPad, iPad mini, iPad Air, iPad Pro, iPod, nano, iPod mini, iPod shuffle, iPod classic, iPod touch, iPhone, iPhone 3G, iPhone 3GS, iPhone 4, iPhone 5S, iPhone 5C, iPhone 6, iPhone 6 Plus, iPhone 6S, iPhone 6S Plus. Give iPad Mate for Mac a try to see what it's really capable of! Copy iPad apps, movies, music, TV shows, videos and photos to Mac directly. Import local files like movies, apps and music from Mac to iPad. Transfer iPad movies and music to iTunes library. Fully supports iTunes 12. Convert CD/DVD discs to iPad supported files and convert ISO images/IFO folder to iPad as well. Convert your favorite videos and audios on Mac to iPad compatible formats and transfer them to iPad directly. Videos and audios supported: M2TS, MTS, AVI, MP4, MPEG-4, MPEG, WMV, DAT, TS, MPV, NSV, M4V, MOV, QT, H.261, H.264, MP3, AAC, WMA, AAC, AIF, AIFF, and AC3. Work well with all iPad/iPhone/iPod models: iPad, iPad 2, iPad 3, iPad 4, iPad mini, iPad mini 2, iPad mini 3, iPad mini 4, iPad Air, iPad Air 2, iPad Pro (12.9/9.7/10.5 inch), iPod, nano (5th Gen), iPod mini, iPod shuffle, iPod classic, iPod touch, iPod touch 4, iPod touch 5, iPod touch 6, iPhone, iPhone 3G/3GS, iPhone 4, iPhone 5/5S/5C/SE, iPhone 6/6 Plus, iPhone 6S/6S Plus, iPhone 7/7 Plus, iPhone 8/8 Plus, iPhone X, iPhone XS, iPhone XS Max, iPhone XR. Support several iOS devices at one time. Transfer apps between Mac and your devices, you can also manage documents for some apps. Read and export photos and videos shot by the device with ease. Transfer iPhone ringtones and PDF/EPUB books from Mac to devices and manage them as wish. Scan the connected iPad automatically and show its model, version, serial number, and capacity. Customize music file information: name, artist, album, composer, and year, etc. Quickly find what you want and search files with the filter which sorts files by Songs, Genres, Artists and Albums. Create your own playlists and copy them to device or iTunes or rename the playlist. Transfer songs from one playlist directly to another. Make your comments on the music files and rate them by star icon. Preview DVD movies and videos with the built-in player. Take snapshots for your favorite images while previewing and save them as JPG, PNG or BMP files. Convert videos/audios in other formats, ISO images and IFO folder on your Mac to iPad formats and transfer them to iPad in one click. 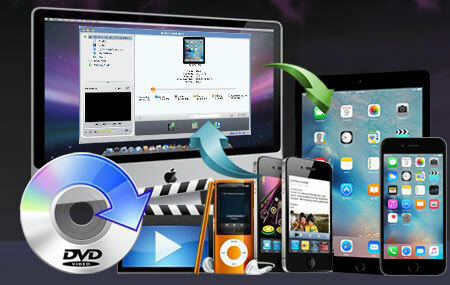 Convert and transfer CD/DVD discs to iPad, watch your desired DVD movies and enjoy music CDs on iPad. • A resizable player is embedded in the Mac iPad converter for you to preview DVDs, videos and audios. Multiple language interfaces available: English, Italian, Spanish, German, French, Traditional Chinese, Simplified Chinese and Japanese. Backup and transfer movies and audios from iPad to Mac, from Mac to iPad, and from iPad to iTunes.